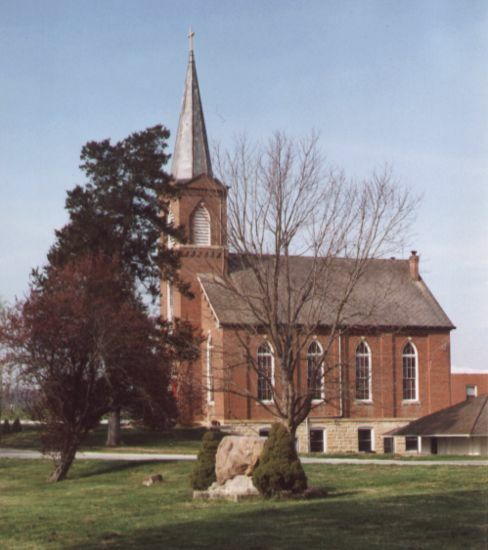 The present brick church, dedicated on 28 October 1884, is the third building constructed by the congregation at Holstein. The large stone in the foreground of this picture, with a brass plaque, was erected across Church Street from the present building in April 1990 to commemorate the congregation's 150th anniversary. The stone stands on the former site of the first two church buildings and is surrounded by the oldest of the three cemeteries at Holstein. The second cemetery is located south of the present church (to the right in this photo), across the street from where this photo was taken. The New Church Cemetery is a short distance north of the present church, near the intersection of Church Street and State Highway N. That cemetery, consecrated on 12 April 1916, is on land that was formerly part of the Dan Oberhellman farm. A brief history of the church and more photos are available elsewhere on this web site. A view from the second cemetery just south of the present church building, looking west and across Church Street to the oldest cemetery and the site of the first two church buildings constructed at Holstein. The memorial stone and plaque are visible on the middle right side of this photo. The parsonage is further to the right, out of the range of the photo. The parsonage and the church face each other on either side of Church Street. Immanuels United Church of Christ is located on Church Street in Holstein, Warren County, Missouri, just off of State Highway N. The mailing address is 17510 Church Street, Marthasville, Missouri 63357. 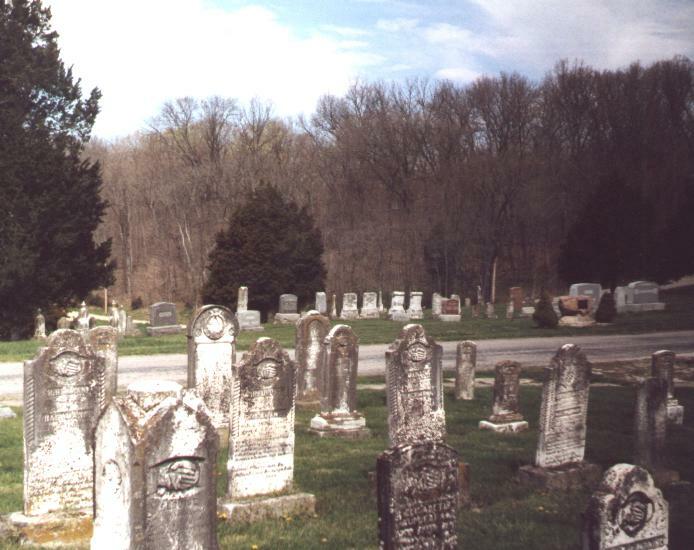 There are three cemeteries associated with the congregation. The oldest is across the street from the church and just south of the parsonage. The second cemetery is just south of the church. The third, or New Cemetery, is a short distance north of the church and adjacent to State Highway N.
Additional photos of burials in the three cemeteries of this congregation are posted on Jane (Lichte) Denny's web site.